New York City is the setting for Julie & Julia (2009). This "foodie film" tells the true story of the aspiring writer Julie Powell (Amy Adams). In 2002, Julie decided to start her own blog about her one‐year challenge to re‐cook all recipes in a cookbook released by her cooking idol Julia Child (Meryl Streep). Inspired by this film, you can go on your own little foodie adventure in New York City. With so many immigrant influences from all corners of the world, you will always find new things to try and enjoy here. Fortunately for travellers on a budget, Free Tours by Foot offers a range of really cool "free food tours". That being said, "free" refers to the fact that you do not pay an upfront fee for the tour (which for most food tours is usually 45 US Dollars and more). Instead, you only pay for the samples you actually want to eat (usually about 2 US Dollars per sample) as well as a tip for your guide at the end. Plus, the areas that they go to are usually less known, more residential neighbourhoods. So even if you have been to New York a few times before, you can be sure to see some new sides of the city! 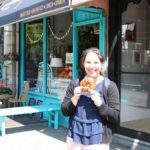 On my most recent visit in May 2017, I tried the East Village Food Tour and the Williamsburg Food Tour. New York is such a huge city that it can get overwhelming and also pretty time‐consuming to find all the good eating places yourself. In my experience, it's best to just join a tour that will lead you straight to these places. With a guide by your side, you will also learn a lot more about the historical and culinary influences of a specific neighbourhood than you would if you just wander around by yourself. The Food Tours by Free Tours on Foot are scheduled regularly. However, they are also very popular. Thus, I recommend you book your tour at least a week in advance. You don't have to pay for signing up, but you do have to fill in a form on their website in order to secure your spot on the tour. Ready to sample New York City? Me and my New York cheesecake! The city of Cincinnati in the U.S. State Ohio was the main setting and filming location for George Clooney's political drama The Ides of March (2011). There is one scene, in which the young intern Molly (Evan Rachel Wood) meets Stephen (Ryan Gosling) in an all‐American diner. I'm not a 100% sure, but it might well be a restaurant of the so‐called "Skyline" chain. This chain is famous for the so‐called Cincinnati Chili. A lot less spicy than it sounds, this chili is made of a special kind of meat‐ or tofu based sauce with a secret chocolate ingredient. 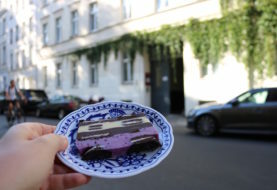 If the chocolate in the chili is not enough to satisfy your sweet tooth, how about the Sweet Stroll Food Tour? 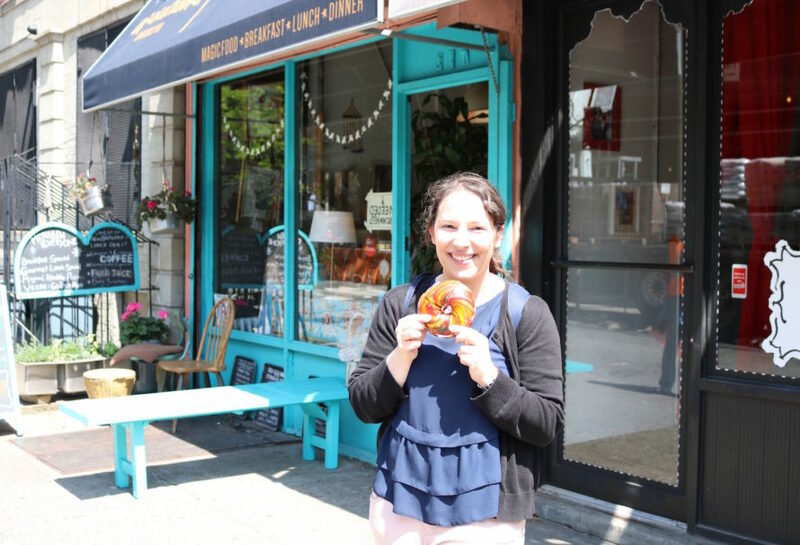 On this tour offered by Cincinnati Food Tours you will be filled with 7 sweet treats while tour guide Barb fills you in on the exciting history of Cincinnati's most up‐and‐coming neighbourhood "Over‐the‐Rhine". The Sweet Stroll Tour costs 45 US Dollars per person. However, I thought that spending this money was really worth it because without a guide, I would have never found all those sweet little gems in just 2.5 hours. Plus, I would have certainly not learnt that much about the intriguing history of the "Over‐the‐Rhine" neighbourhood, mainly shaped by German immigrants. 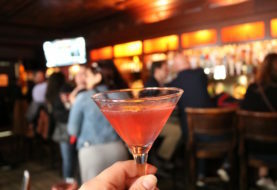 Early booking is recommend as the Cincinnati Food Tours are quite popular, too. Although set in Seattle, both Fifty Shades of Grey (2015) and Fifty Shades Darker (2017) were largely filmed in Vancouver's historic Gastown district. So by joining a food tour in West Canada's coolest city, you can combine both sampling yummy Canadian food and seeing some filming locations of the famous movie. This restaurant in Gastown was used as a filming location in "Fifty Shades of Grey"
In many ways, the Canadian food is similar to that in the US. However, there are also some very distinctive Canadian dishes, such as the "Poutine" (French Fries with a special kind of gravy sauce and vegetables). You can try the Poutine and other Canadian delicacies on the Gastronomic Gastown Tour offered by Vancouver Foodie Tours. Aside from Gastown, Vancouver is equally famous for its large outdoor market Granville Market, which you can explore on the Granville Market Tour. For those that want to try even fancier food, check out the Guilty Pleasures Gourmet Tour. And for the most authentic Vancouver food, try some world‐class street food on the World's Best Food Truck Tour. Me and my Canadian "Poutine"
I really enjoyed the fact that we sat down at every restaurant we visited. Since the tour took place from 3 pm in the afternoon, it was really quiet in most places, so we had enough time to enjoy our food and learn more about the Vancouver's intriguing history with our guide. The samples were really filling, so I had my lunch and dinner sorted in one afternoon. Finally, don't be alarmed by the price. CAN Dollars is less when converted into US Dollars or Euros, so 79.99 CAN Dollars (the standard price for the tour with non‐alcoholic drinks) and 99.99 CAN Dollars (with alcoholic drinks) are about 53 or 67 Euros respectively. This tour is also very popular, so make sure you book in advance! At least a week is recommend. A (cheese)cake lovers heaven in New York City!